The Nobel Prize committee named Paul Kragman as the winner of the Nobel Prize in economics "for his analysis of trade patterns and location of economic activity." He is a professor at Princeton, I learned, but he also writes for the New York Times, and he's one of the people who has been giving advice about the current financial crisis and he makes a lot of sense, even before he won the prize. His ideas about injecting government capital into banks seems to be an idea that is catching on. Maybe more people will listen to him about this now that he's more famous. It did seem a bit ironic to me that the prize for economics was announced in the middle of all this financial trouble. What do you suppose he's going to do with his prize money? My friend Kathy is not only a seasonal adjuster, she's also a knitter. She sent the following web site to a bunch of us yesterday. Our friend Brian responded that he thought that was seasonality because "there's DEFINITELY a peak." It's been on everyone's lips all around campus for months and months. Preparations and security and have taken all our good parking spaces and made even walking around campus difficult. But tonight is the night, and I'm hoping that on Thursday I can find a good parking space again. 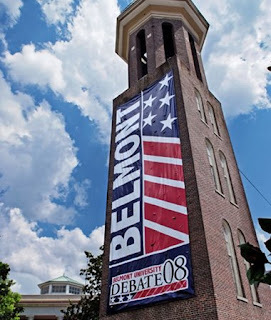 Belmont's tag line for the year: "The road to the White House runs through Belmont University." I took economics in high school and learned absolutely nothing, except how really bad a class could be when the teacher came to work drunk. I didn't take economics in college because I couldn't imagine it could be much more interesting than my high school class because I couldn't imagine a professor at Furman coming to work drunk. I have really enjoyed learning more about economics as I was involved more and more with economic statistics. However, I readily confess that the subject does NOT make me giggle. So imagine my surprise, as we're watching serious news programs on television, that my girls (and especially my oldest), start to giggle at the phrase "Keynesian Economics". It turns out that one of my girls' favorite actors, from two of my girls' favorite movies, is actor Skandar Keynes (Edmund Pevensie in both The Chronicles of Narnia: The Lion, the Witch and the Wardrobe and The Chronicles of Narnia: Prince Caspian). Skandar is the great-great-nephew of famed economist John Maynard Keynes and the son of author Randal Keynes. It also turns out, according to IMDB, that Skandar is the great-great-great grandson of Charles Darwin, but that name doesn't make the girls giggle as much as the name "Keynes" (pronounced like "canes", for those of you unfamiliar with the movies or Keynesian economics). You can see if it makes you giggle. I really enjoy teaching, and I don't regret at all taking the job at Belmont University, and I feel so privileged and blessed to be able to teach my children at home. But Praise God for summer! It's so nice to have a break from the teaching and to be able to really focus on some time series projects for my consulting business. One goal I have had for more than a year now is to get my courses on the web so that individuals could take the courses on their own computer. But my courses are copyrighted, so I can't just put them up for anyone to see. I've talked to several people, but no one who works in web design could quite catch my vision for the courses. So after more than a year thinking and dreaming and talking to people about this, I finally made a huge breakthrough today!!! I am learning PHP, and I'm finding some wonderful free code, and I'm finally beginning to think that I can really get this done this summer. My goal is to have the slides on the web, with notes and sound files of me talking, and have it all password protected. I also found my notes on that user-defined holiday project I started while still at Census, and as I went through my notes, I realized that I was even farther ahead on this program than I had remembered! So a very exciting day all the way around! I finished all my work for Belmont over a month ago, and it's been a relief. I really enjoy teaching, but I have some really interesting consulting projects, and I still had to get my girls through their school. And today, we're officially finished! The two younger girls finished up a couple of week ago. My oldest finished up her last set of book reports today, and we put them in the mail. I finished up my programming project (and was paid promptly). It was nice to be working in SAS again. It had been a long time. It was nice to know I could still work on SAS macros. It also inspired me to work on my Visual Basic program again for user-defined holidays. I had started it at Census as a SAS macro, but I want to get it into something more practical than SAS. I also want to do some research on different kinds of Easter effects and other related holidays for the Joint Statistical Meetings of the American Statistical Association in 2009. Next week I hope to sign some contracts for another fun seasonal adjustment project. It looks to be a very exciting summer for me! Today is the three-year anniversary of the day I left the Census Bureau. To celebrate, I gave the girls a day off from school. Mom was here for the weekend to help me celebrate my birthday and Daddy's birthday. We celebrated both by going to a scrapbook day at Rita's house. I'm working on a scrapbook for me about my dad. But first, I do need to finish grading tests, and cleaning up some in my office so I have the space to work on scrapbooks. And then there are taxes to do, and lesson plans, and some programming to do for clients . . . .
My oldest took her written drivers' test on Monday, and she passed, so she now has her "graduated driver's license", what used to be called a learner's permit when I was a kid in Tennessee. On the same day that my oldest took her driving test, my youngest started high-school-level algebra. It's hitting me hard that the girls are really growing up. They are making fun of me, but it's more difficult than they think. A young man is sent to a maximum security prison for larceny. As in many jokes and movies about prison, the young man ends up sharing a cell with an older, veteran prisoner who takes a liking to him. The first night in the cell block, the younger man hears something strange. Someone calls out, "Sixteen!" All the prisoners laugh, except for the new kid. After a several more numbers and much more laughter, the new guy asks the older prisoner to explain what everyone's laughing at. The older man says, "Well, at night, we've got nothing better to do than to tell jokes." "But they're not jokes," the younger man says. "They're just numbers." "That's all you know," the older man replies. "The thing is, we've all been here so long that we've heard all each other's jokes so often that we've memorized them. So rather than tell the whole joke again, we've numbered 'em all. Now we just remind each other of the joke by calling out the number." "Really? Can I try it?" The young man turns to the older prisoner and says, "I don't get it. What's wrong?" The older man shakes his head. "Some people just don't know how to tell a joke." The only thing that made the joke funny in church is that the person telling the joke messed it up so badly that people were really confused and no one really laughed --- some people really don't know how to tell a joke. But I had heard the joke before, a long time ago, and this time it reminded me so much of my friend Kathy that I was laughing at the joke long before Pastor Tommy started getting confused, and long before he told the punchline. When Kathy and I were working together at Census, several years ago now, the division chief of our division back then sent an email to the entire division that said, "There are 10 kinds of people in the world - those who understand binary and those who don't." We had heard the joke before, and we thought it said 11 when we'd heard it before. My friend John said that he though it was supposed to be 11 instead of 10. So Kathy and I sent a message to everyone in our address books on our home email accounts and asked them which number they thought was funnier, 10 or 11. We also starting asking people in person or on the phone. Several of our relatives wrote back that they weren't sure which number was funnier, but that they thought the two of us were crazy and/or insane. I remember my dad thought that 10 was funnier because it was a nice, round number, and Mr. West, the guard at the front desk thought that 11 was funnier because it was closer to midnight, and he got off work at midnight. After that, there was a SpongeBob episode were Patrick goes with SpongeBob to boating school, and the kids and I happened to see it on TV while were were shopping for batteries at a Radio Shack. Kathy happened to see the same episode. Patrick gets nervous and tells the class his name is 24, and the class laughs. SpongeBob says, "You know what's funnier than 24? . . . 25!" And there were times when someone would say a number, and Kathy and I would just start laughing, like the time we went to Bojangles for lunch and Kathy had ticket number 24 and I had number 25, or the other way around, and we both looked at our numbers and just started laughing. The lady who took our money asked what was so funny. I told her that I was doing my SpongeBob impersonation. She said, "Yeah, I like SpongeBob, too," but she still looked at us like we were insane. My oldest and I were at the county seat the other day and had to take tickets to talk to the ladies. We had numbers 10 and 11, and we both just started laughing. It's not exactly like the prison joke, but there are some numbers that remind me of people or of other jokes, and they just make me laugh. So when I saw this speed limit sign, I had to take a picture, even if it was hard to take a picture of a shining sign in the dark. Where else was I going to see a speed limit of 24? I have had several inquiries for my consulting business --- some really interesting seasonal adjustment work and some SAS program debugging. All of the potential clients seem to be easy to work with at this point. I'm also trying to work out a way to get some of my courses on-line for people who want to pay. I need to talk to my computer support people about this again and see if he has any suggestions. I really also need to do a mailing, but I don't know when I'm going to find the time. I have some programming projects of my own I should be working on also. I also found out this week that I will be teaching again at Belmont for the Spring semester, which starts next week. I need to redo my syllabus and get ready to teach again. I know it will be easier this semester, but right now it seems a bit overwhelming on top of everything else. And I have a pile of tests to grade by the middle of the month when we need to send in the next batch of work to my oldest daughter's correspondence school. I hope everyone is having a great 2008. Go Ohio State!